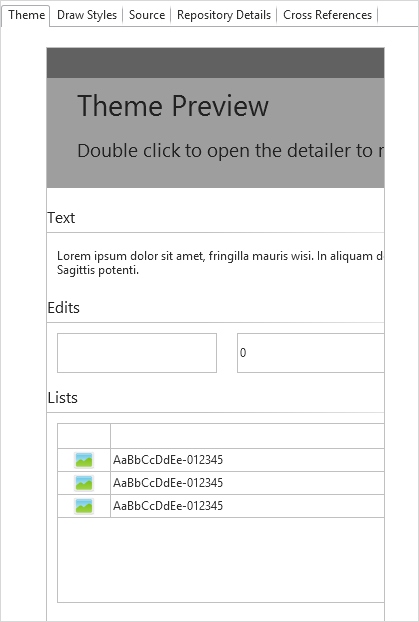 Double-click the preview to start defining the theme. The theme details are displayed in the Details tab. 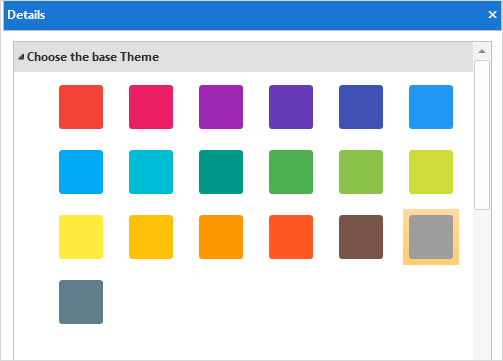 The base theme is one of the LANSA supplied themes used to define the colors in the color palette. The themes are based on a particular color. We recommend you create your own themes because it cannot be guaranteed that shipped styles will always remain the same. When a base theme is selected, the colors in the color palette are updated. The colors in the palette provide a basic set of complimentary colors. Colors 50 - 900 and the 4 accent colors, A100 – A700, are used in many places throughout a LANSA applications and are not intended to be changed on an individual basis. All additional color requirements should be managed via draw styles. The color used for selected and focus list items when the list is not the focus control. The color used for controls that are not enabled. The default color for all borders. The color of the vertical and horizontal lines in a list. LANSA will default to Verdana for all Visual LANSA applications for the web, but it is recommended that a font be specified. The global theme definition is now ready.